California State University, Northridge faculty member Mechelle Best has co-authored “Contemporary Caribbean Tourism: Concepts and Cases,” a comprehensive text on the Caribbean tourism economy that explores tourism as a global phenomenon. Born in Barbados, Best, a professor in the Department of Recreation and Tourism Management in CSUN’s College of Health and Human Development, said she deliberately chose to pursue a career in tourism. She said that for most of the Caribbean, the tourism industry has often been a place of last resort for people who cannot find other jobs. According to Best, the Caribbean is the most tourism-dependent region in the world and the majority of employees in that industry do not have tertiary education. She was curious to know if secondary schools were preparing students with a sufficient education in tourism and conducted interviews with educators. She was invited by the Caribbean Examinations Council (CXC), a regional organization that creates syllabi and the exams for 23 countries in the Caribbean, to chair a panel to develop a new subject in tourism at the advanced level for secondary schools comparable to first-year university courses. Creating a syllabus inspired her to write the textbook with her two Caribbean colleagues, Sherma Roberts and Acolla Cameron. More than reviewing job training or skills, “Contemporary Caribbean Tourism” offers a comprehensive and critical approach to looking at recreation and tourism management from macro and micro perspectives. The book explores the intersection of the environmental, economic and social impacts of tourism. 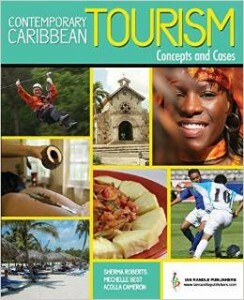 The book is not only a resource for those in the Caribbean, but can be used by students in the United States to explore the same critical concepts in tourism. Best used segments of the book in one of her CSUN classes this past spring semester to explore how Americans affect the Caribbean in specific ways, such as medical tourism, in which Americans travel to get medical procedures done at a much lower cost than in the United States. Published in December 2014, “Contemporary Caribbean Tourism” has been well received in the Caribbean. It has been praised by high-ranking tourism officials, such as the CEO of the Caribbean Tourism Organization, university leaders, professors and students, and is being reviewed by the CXC as a recommended instructional resource for schools teaching tourism. The responses showed her that the book did more than fill the gap in tourism education but was also about Caribbean identity and the Caribbean point of view. If the English version is successful, Best said she hopes the book will also be translated into languages serving the needs of the Spanish, Dutch and French Caribbean. Best is currently working on her next book about slavery heritage and tourism in the Caribbean.